Warm weather, lots of visitors for the Keukenhof, and lots of tulips in bloom. Last week was a beautiful week to visit Keukenhof. The indoor tulip exhibition is in full bloom and looks wonderful. Outside in the Keukenhof the daffodils and crocus are blooming and the first tulips are visible outside. What a difference with last year. In 2013 due to the strong cold winter we had the tulips in bloom at the first week of May. This year we are 6 weeks earlier! The last couple of visits, I have spend a lot of time at the indoor tulip exhibition. All new varieties and colors, I can’t stop photographing 😉 Outdoors the tulips are slowly getting to bloom. We had 20 degrees celsius for a couple of days now, the tulips are growing very well and I expect to see a couple of them in bloom by next weekend. For the people who are traveling at the end of April, beginning of May don’t worry. 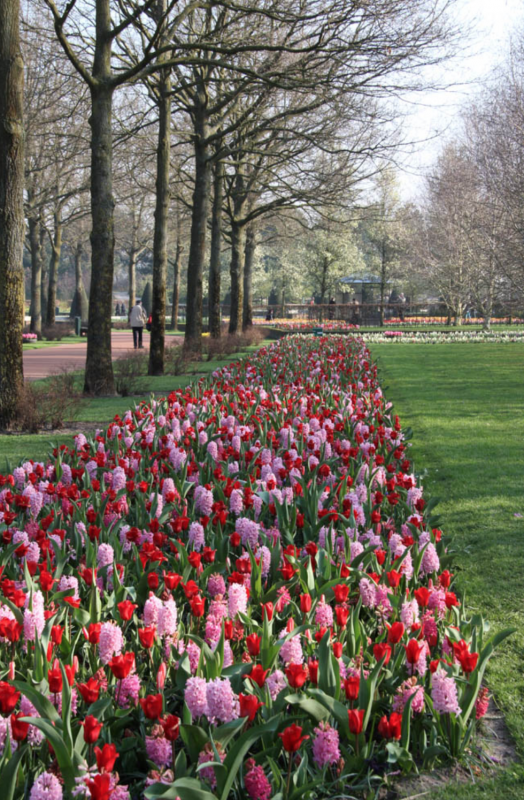 The Keukenhof uses the lasagna technique for the flower bulbs. The first layer (top layer) is in bloom / getting ready to bloom now. In a couple of weeks the second layer (mid layer) wil bloom and at the end of season the third (last layer) will bloom. In the flower fields the crocus are almost gone now. The daffodils and the hyacinths are in full bloom. It looks very colorful driving around the Lisse area. When you arrive by plane make sure you have a window seat during landing. The early (red) tulip fields are in bloom and the normal tulips are about to bloom in a couple of days to a week. Have a look at the photos in the photo stream to get an actual view of the Keukenhof in bloom. And if you have any questions please post below. Have a great tulip week! Fantastic! I will be at Keukenhopf on April 10 and looks like I’ll get the show of a lifetime! We will be visiting the gardens on May 17. Will there still be pretty flowers that late? Hmm that is a good question. We have an early spring time this year. Don’t know if we will have still some flowers left at the kids of May (end of spring). If you sign up for the weekly flower update you will have a weekly update with photo’s to see if it is worthwhile to visit keukenhof. i am pretty sure that the flowers in the fields will be gone by then. Kind regards for Holland! Will be in Amsterdam April 27 to may 1. With the early spring will there still be flowers at the gardens and fields? How do you think the tulips will be on the 26th of April? We are visiting this week and would love to know where to go after Kukenhoof to see flower fields. Thank you! Have a look at our map https://www.flickr.com/photos/nring23/13270086445/in/set-72157629851281653 to see where you can find the flower fields. Have a great time visiting the Keukenhof and the flower fields!